During this high end interface products Nokia is still limited by the operating system that is faithful squire. In order to create a multimedia interface that is unique and fun, Nokia is also updating the operating system that is the new operating system Symbian S60. 5800 is the most new members XpressMusic. This means this product is prepared to become a multimedia player. No one directly if you remember the product Apple made music mobile phone, which is a combination mobile phone with one of the famous brand music player iPOD. The ease of access, style and fun is the keyword. When compared with the mobile phone that has a similar user interface, the Nokia 5800 can be spelled out more XpressMusic more like a mobile phone. This means XpressMusic Nokia 5800 mobile phone has the size in general. Does not follow on the proportion of N series, but remains faithful to the path that has the characteristics XpressMusic normal size with the accent on the tip of the rounded top and bottom so it looks like oval. XpressMusic Nokia 5800 is a candybar phone with keypad on the front. Touch screen dominates this section. But the key as usual call / end button and a dedicated menu button as the present fixed at the bottom. The same as you find on the iPhone or Samsung Omnia. The effect, Nokia should play a brain to be able to realize such a device. Which somehow appear first, Symbian S60 5th edition is able to facilitate such a capability. Previously, only specific symbian UIQ, for example with a touch interface. With the new OS, the classic problem will appear. For at least 6 months ahead we will find it difficult software compatible to the OS. The only advantage gained from the new interface is unique. Many new things that we can find. For example, media bar, which contains a number of shortcuts to the multimedia functions. Then the presence of hidden shortcuts that can be accessed by touching icons hours, until the sensor in the face of a smart phone to avoid the depressed its screen when the phone or activate the silent mode with only flip phone. 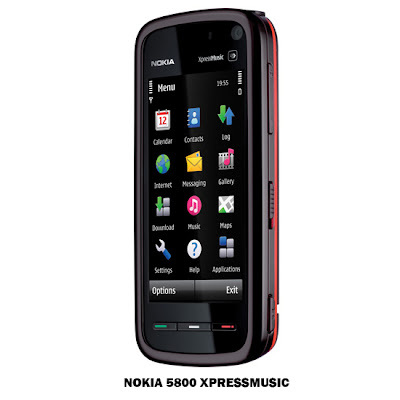 XpressMusic Nokia 5800 is a music player. Software that is used is a software based on Symbian music player before, that we find in the usual Nokia Series N.
The quality of the music player can be spelled out satisfactorily. Almost all the features of the digital music player the new already in the phone. Even with the support of stereo speakers that have a double chimney and widening sound system reliability, the output voice can still be spelled out even though both the headset and without additional speakers. XpressMusic as in the other, the music player the Nokia 5800 XpressMusic also accompanied by a number of additional features such as a music store and transfer music files from CDs. Music mobile phone that has a touch user interface is also equipped with GPS receiver and Nokia Maps. Learning from the experience, Nokia has to improve the map and navigation system owned. This will make it easier for owners of Nokia mobile phones are equipped with GPS and the latest version of Nokia Maps. Unfortunately, for the Nokia 5800 XpressMusic own full navigation is only given for 7 days free usage. In addition to bringing a typical mobile phone's browser Symbian S60, Nokia 5800 XpressMusic also brought a number of fast connections. Among them is a HSDPA 3.6 Mbps and WiFi. With the portion of the screen, such as widescreen LCD computer ratio of 16:9, then the browsing will be more free. They also control the user interface touch enough friction to assist in a page (panning). Support HSDPA and WiFi ready to support the process of uploading files, especially photos and video directly from mobile phone to the portal of your choice. Nokia OVI choose as a means to share online. You can do this in a way to access the images and select the option to upload. Although not a camera that has high resolution at this point, the Nokia 5800 camera XpressMusic quite good in the photos spontaneously. Simply because it has good features autofokus and other advanced settings. Some features of the Nokia 5800 is a factor that XpressMusic spendthrift energy. To put the batteries that have been prepared. The type and capacity Lithium Ion 1320 mAh, it seems that all will not be a problem. But the fact is that large capacity can not support all the features that have the maximum. In one mobile phone charging stand is only 2 days with normal usage. Nokia 5800 XpressMusic have a responsibility that is not light. Bringing a new interface and automatically become prime product with the latest OS to make foreign products in the midst of an increasingly tight competition. But however User Interface touch still has value selling retired, able to cause the fun factor, this is the first mobile music. Completeness of the connection and the GPS is that you can enjoy the Nokia 5800 XpressMusic. However, you will need a little time to interact with the mobile phone to this. Unless you buy it just for style.